To Tribute Summon this card face-up, you can Tribute a Continuous Spell/Trap Card you control, instead of a monster. Once per turn, during either player’s turn, when your opponent activates a card or effect while you control this Tribute Summoned monster: You can take 1 “True Draco” or “True King” Continuous Trap Card from your Deck, and either activate it or add it to your hand. Dinomight Knight, the True Dracofighter is a Level 6 Water Wyrm-type monster with 2500 Atk and 1200 Def. Summoned Skull Stats have always been good. The difference being Water and Wyrm, which are supported. Also, Dinomight can be Tribute Summoned using any Continuous Spell or Trap Card. Then, when your opponent activates pretty much anything, you can search a True Draco or True King Continuous Trap from the deck to your hand or just activate it. Activating a trap from the deck is really good. Even at only once per turn and one per deck, the effect is definitely worth the investment. I honestly hope True decks don’t die, and Dinomight Knight will definitely keep it alive. Happy Friday. Since Master Peace went from three to zero, Konami thought this card would be fine to bring from zero to one to give True Dracos consistency to replace the power lost, I am talking about Dinomight Knight, the True Dracofighter. Dinomight Knight is a Level 6 WATER Wyrm with 2500 ATK and 1200 DEF. Stats are fine for a Level 6, WATER is a good attribute, and Wyrm is a fine type. Just like Ignis Heat earlier this week, Dinomight Knight can be Tribute Summoned by tributing any Continuous Spell or Trap, and I don’t need to go into much detail about why that is good again. 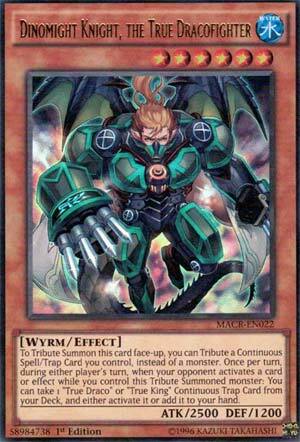 Why Dinomight Knight was banned was that when your opponent uses a card or effect, you can take a True Draco or True King Continuous Trap and either add it to your hand or activate it on your side of the field. I see zero reason right now as to why you shouldn’t activate the Trap. You can literally bypass the inherent slowness that Traps typically have in that they have to be set and wait a turn before they can be activated. This also helps get to True Kings’ Return, which is still limited as we speak. Dinomight really helped the consistency and speed of True Dracos, but it wasn’t the card that needed the ban when it got it, and they now realized that as it is now limited and Master Peace is gone instead. Dinomight can stay at one, three is too much. Dinomight is mandatory for True Draco decks, play as many copies as you are allowed, which is currently one. Art: 4.25/5 I don’t remember Dinoster being green before. What, did he not like blue? Dinomight Knight, the True Dracofighter, is the only card we look at this week that comes off the Ban List, moving down to Limited. Honestly, this review is (obviously) so similar to earlier when we looked at Ignis Heat…so, same Tribute loophole, can gather you a True King or True Draco Continuous Trap this time, and it can (like the Magic card earlier) be added to your Hand, OR activated. The 100 extra attack is cool, but not game breaking enough to make it BETTER than his fire counterpart. Water, as opposed to Fire, just as good in my opinion as earlier this week. Still a focal piece of the Deck no doubt.